Working from home may allow you to have flexibility, but it doesn't always mean you'll have consistent work. You can get the best of both worlds by becoming a work at home support representative with TTeC. TTeC is currently looking for friendly, self-motivated individuals to join their team of associates located across the U.S.
TTeC is a business process outsourcing company that was founded in 1982. Founder, Ken Tuchman, wanted to find a better way to connect clients with customers so they could get the help they needed. The team at TTeC focuses on interacting with clients' cust0mers through a variety of communication channels and devices like voice, text and chat to email and social media. TTeC hires part-time and full-time customer service reps throughout the U.S., Canada, and a few other countries in Europe. 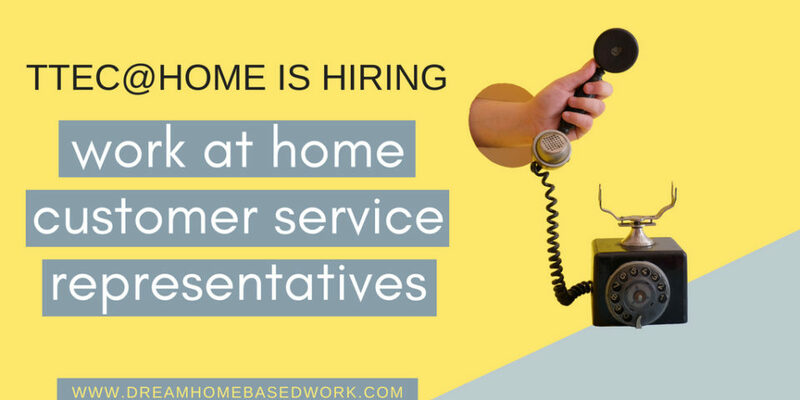 As a work from home customer service rep, you'll answer inbound calls and emails from customers. You'll also assist customers of major consumer brands with their questions about products, services, and creating a pleasant and helpful customer experience. TTeC provides paid training and ongoing coaching and support to help you excel at the job. All training is completed online or on the phone Note that this remote job is only available in select states so you must meet a location requirement. Currently, this role is not available in the following states: CA, ME, MD, NJ, RI, WI, OR, WA, NY, CT, MA, VT, HI, AK, DC, AZ, CO, KY, NV, OH, Chicago IL or the Virgin Islands. You should also own your own computer that meets these minimum requirements. 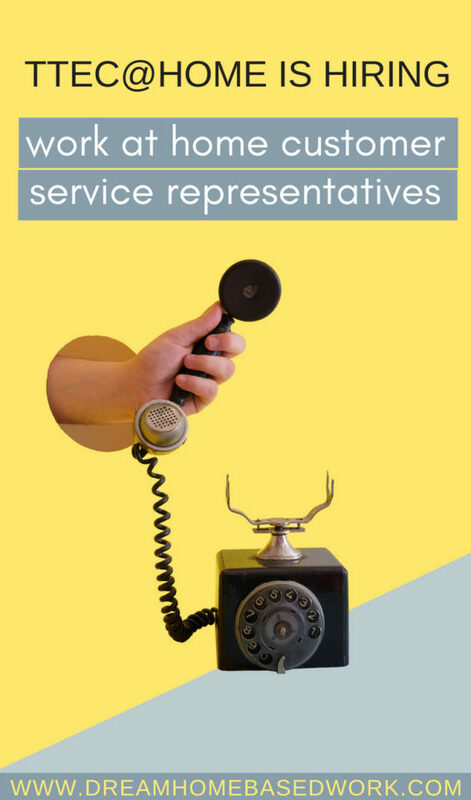 A dedicated telephone is required during employment (landline or cell phone) to ensure that you can be contacted throughout training and employment as needed. Work schedules vary and are determined based on the hours of availability you indicated you during the application process. Specific hours vary by client project. With any project, you should be able to commit to a minimum of working 4-6 consecutive hours per shift. Compensation for this position isn't specifically listed on the job posting, but according to Glassdoor, you can expect it to be around $9 – $10 per hour. Ready to apply? If you are interested in this position, please start the application process here – https://www.ttecjobs.com. If your application is approved to move forward in the process, you'll complete a series of pre-hire tests designed to measure a variety of skills, competencies, and aptitudes. If so, I recommend checking out FlexJobs. This is a membership site with tons of hand-screened job leads from reputable companies. You can go here and see which customer service openings FlexJobs has up now. Good luck! For more jobs like this, check out our job board with the latest job leads and extra cash gigs. Shay, first, thank you for everything you are and do. You are a life saver for those of us who need every option available and a wide variety to choose from. Second, I wanted to point out that I had applied with TTEC several weeks ago for their Work at Home position, which they drug test for. I applied online over a month ago. The branch that took my application was based in Colorado. I had visited family there almost 2 months before applying, and enjoyed recreational medicine that I previously had a card for because of several disabilities. I had hoped that I would be clean by the time I took the drug test, because it has always done so very quickly. On my part, I should have done a home test and maybe waited to apply. I was honest with them about my use and worried about the drug test. They said I could always reapply. Fast forward to having all except one pre-training item finished, which was not required until 3 days before my orientation date and before training. They mentioned this in their emails and paperwork, and the 2 separate web and chat calls pre-hire that we had done with them. I still had over 12 days to complete this. However, I was still emailed by a TTEC employee, and urged to buy the USB and headset if I had not already, to complete the last computer test. I reluctantly bought the USB (already had headset I could use) and the day after, was contacted both by telephone and email to call back. Neither mentioned my drug test, just that my training date was changed because they had important information that they need to update me on. I made over 6 separate calls in a week and over 5 emails over 2 weeks about it, and had 3 employees at TTEC notate my application to be contacted about my drug test results. I finally connected to someone on a 6am call back out to TTEC, and was informed of my failed drug test and inability to reapply until 60 days have passed. The problem lies with the fact I had let them know about my one time usage when going out of town, and that I had tried to call, email and online chat with them to get more information about my drug test before buying anything. Out of the 3 employees who had notated my profile about the test results, the last had been contacted almost 8 days before I received an actual call back from them, and 6 days before receiving an email. The whole experience was completely unprofessional on their part, as I was open and honest with them. They do not have specific departments to chat with, just people to forward the information. Now I have a USB that I need to return and am looking for work again. I’m sure with your site and leads that I will find a job very soon, but it is unfortunate that TTEC is so unorganized. And it seems they do have happy employees and good pay. However, they are very closed off. Sorry to ramble on, but I wanted to let you and others know to keep themselves in check and organization when applying. Also, with their limited response time, I would definitely advise anyone applying here to respond to calls or emails within 5 minutes if you want a response back ASAP.